This Christmas our friends Travis and Beth at Trevoole sent us a copy of ‘Dear Friend and Gardener’, a collection of correspondence between distinguished gardeners Beth Chatto and the late, great Christopher Lloyd. I got stuck in immediately, relishing the robust exchange of opinions on such matters as organic gardening, whether to water during a drought and how much is too much to pay for a snowdrop bulb. It’s an emminently entertaining book and one which I shan’t put down until it’s finished, save to write this post. I can’t imagine why I haven’t got around to reading it before, but I could say that of many worthy books! One thing that Beth and Christo agreed on was the joy of seeking out little details in the garden during winter. Through the rest of the year there is so much to appreciate that it’s easy to overlook the minutiae, but during the colder months the smallest things can bring disproporionate pleasure. With such thoughts in my mind and the zoom lens attached we set off for Hampstead, eager to walk off the excesses of Christmas Day. This lengthy perambulation is now something of a tradition, as is the gloomy weather which seems synonymous with Boxing Day in London. For those of you less familiar with this part of the capital, Highgate (where we live) and Hampstead are two historic villages separated by an expansive heath, on high ground just north of the city. Although evidently managed, Hampstead Heath is about as natural as things get in this urban area, a refuge for birds and home to some magnificent old trees. Both Highgate and Hampstead are decidedly well-to-do and have attracted for artists (such as John Constable), politicians and the wealthy over the centuries. This morning the muddy paths across the heath were packed with the Panettone munching, Sauvignon Blanc swilling, labradoddle owning middle classes, all on a similar mission to ourselves. 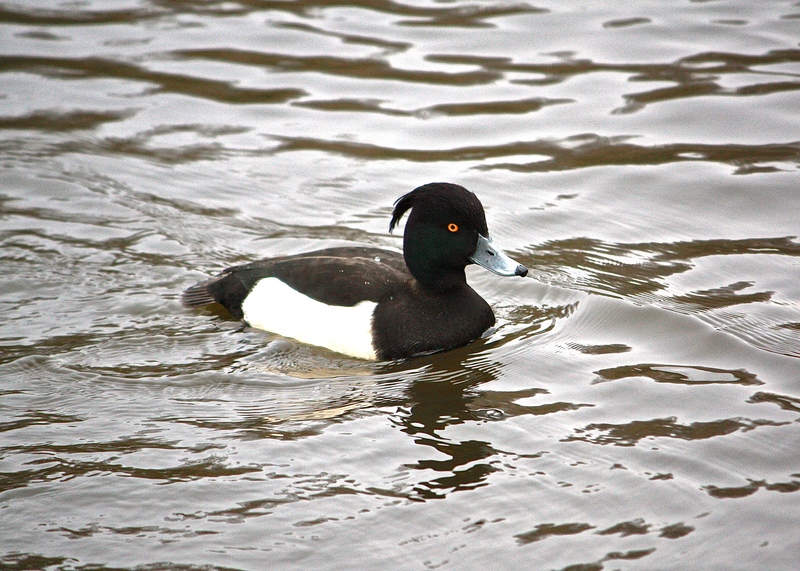 We joined their nicely brought-up children feeding the wildfowl (and thieving gulls), including this charming tufted duck. In terms of little details much of the action was going on above our heads. 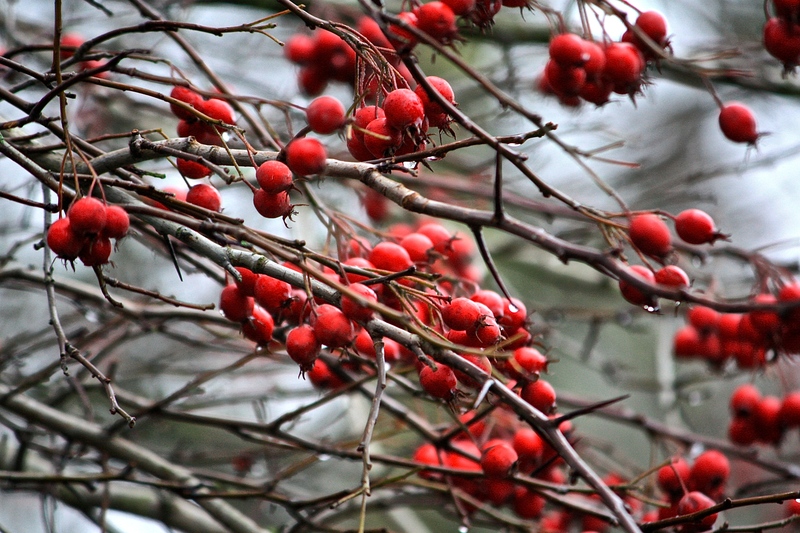 A mild start to winter means the birds have not yet stripped all the berries, crab apples and hips from the trees and bushes. Against a limpid sky the glossy fruits stood out like tiny jewels. There were a few casualties during the recent storms, mainly ash and birch. Much too young to die was a juvenille turkey oak, still holding onto its russet leaves, prostrated across a pathway. 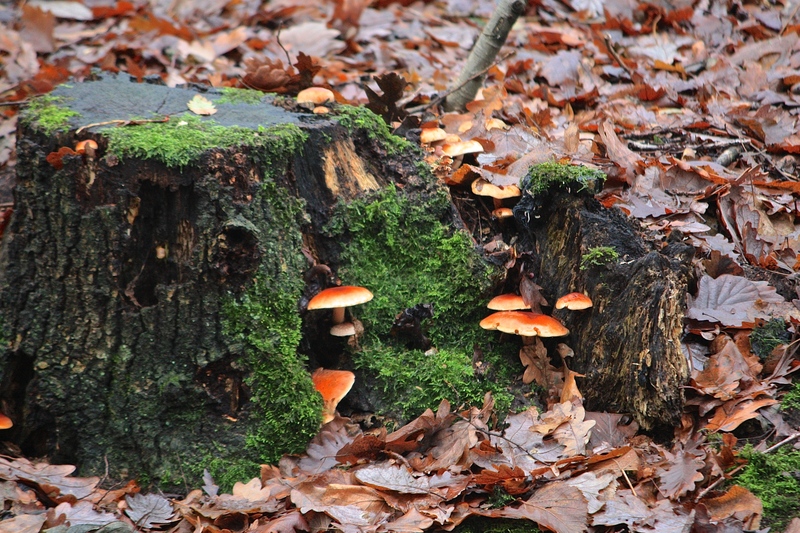 Even amongst the decaying leaves and tree stumps there was something to look at, in the form of little fungi feasting on the rotting wood. We left the soggy heath at Well Walk. 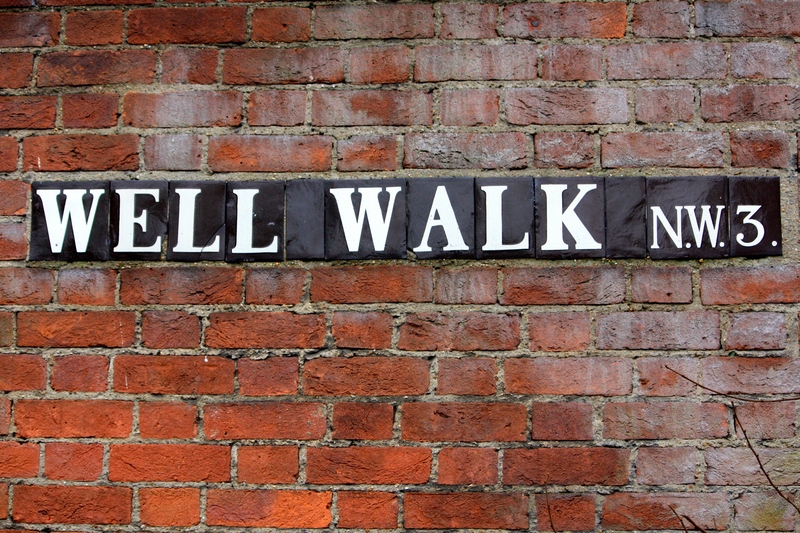 It was in this genteel, tree-lined street that John Keats wrote “Endymion” which famously begins with the line “A thing of beauty is a joy for ever”. 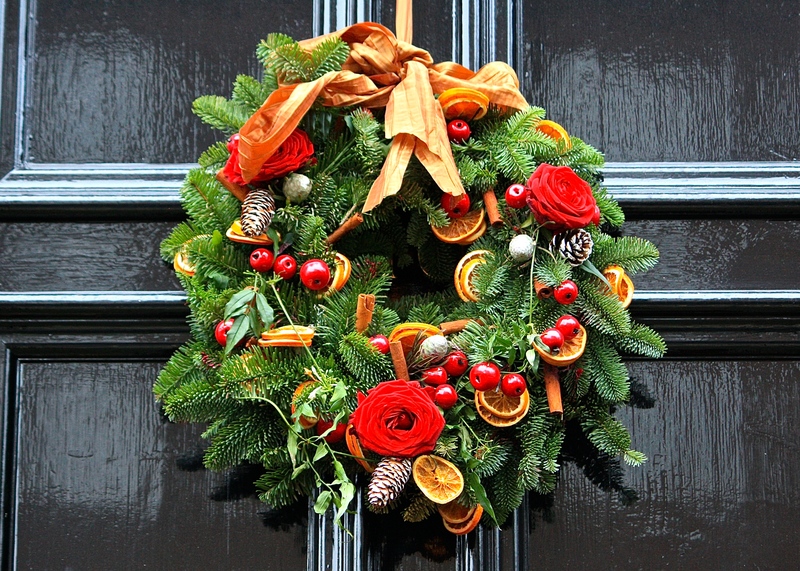 The houses of Hampstead each had fine Christmas trees in their windows and extravagant wreaths adorning their handsome front doors. This pretty combination of eucalyptus, lavender and pine cones looked especially chic against black gloss paintwork. Much is made of lists of plants in bloom on New Year’s Day, but as I expect to be nursing a hangover, I carried out my unofficial survey today. On our walk I spotted yellow Meconopis cambrica, campanulas, centaureas, penstemons, fuchsias, wallflowers, roses and diascias, hanging on for dear life. All shared a kind of drenched, sallow look, as if waiting for the end to come. 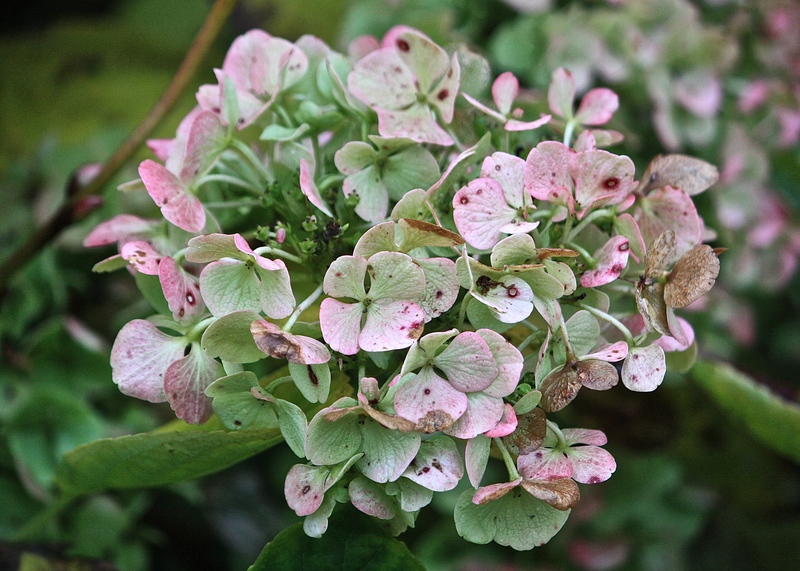 Wearing its winter pallor with aplomb was this hydrangea, one of the few flowers which really knows how to grow old gracefully. 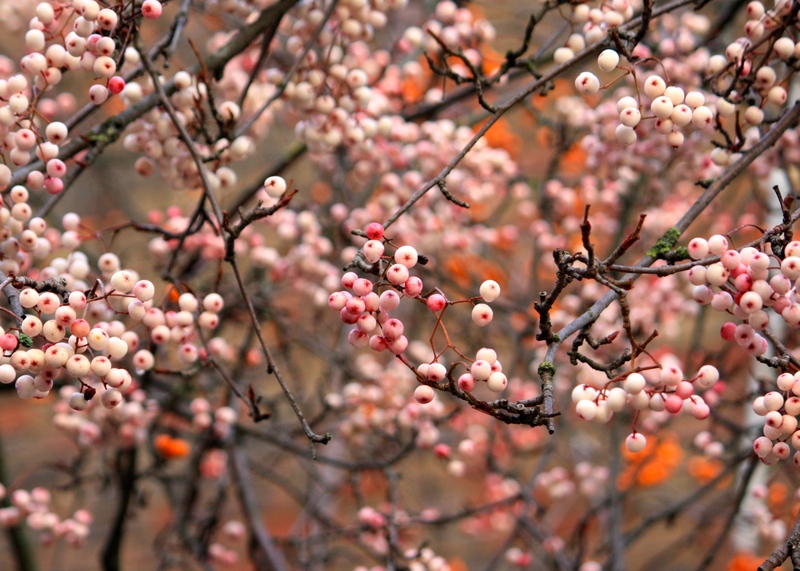 Back to berries, an excellent alternative to all the fiery reds, oranges and yellows was Sorbus hupehensis, the Hubei Rowan. At close quarters the fruits were the colour of a spotty teenager’s skin, but from a distance they appeared delicate, pretty and even striking against a dark background. Surprised at the variety of plants and trees which were still in good shape at the turn of the year we neared home again. 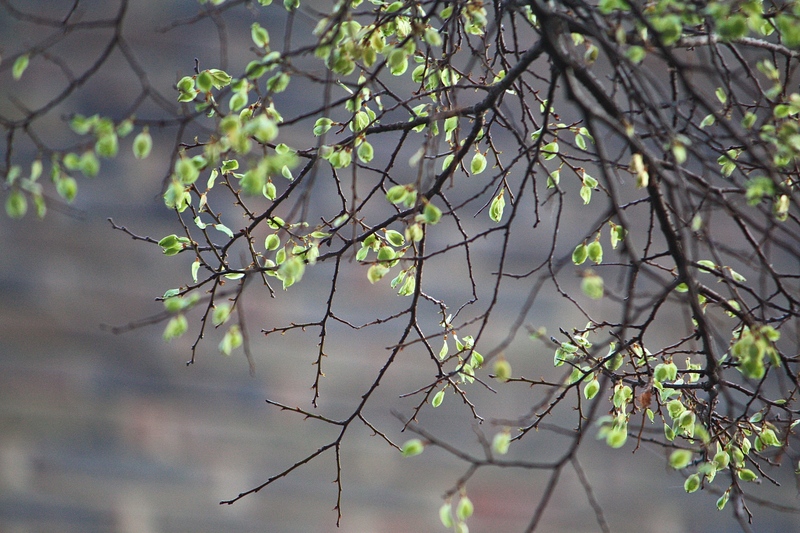 A large tree (as yet unidentified) gave us false hope of an early spring, its pale green seeds caught in a shaft of weak sunlight. They looked for all the world like new leaves. It will be a good three or four months before this comes to pass, but in the meantime we can look forward to many little details including snowdrops, aconites, cyclamen and crocuses – maybe not as impressive as summer’s bounty, but sufficient rations to keep us gardeners going through the depths of January and February. I did indeed! Excellent choice, as always. Thank you so much. Hope you have your feet up after a busy day? I read that book a few years ago and loved it. It would be well worth another read. I agree. I like a book that can be picked up as and when, as I so rarely have time to sit still for long. Happy New Year to you! 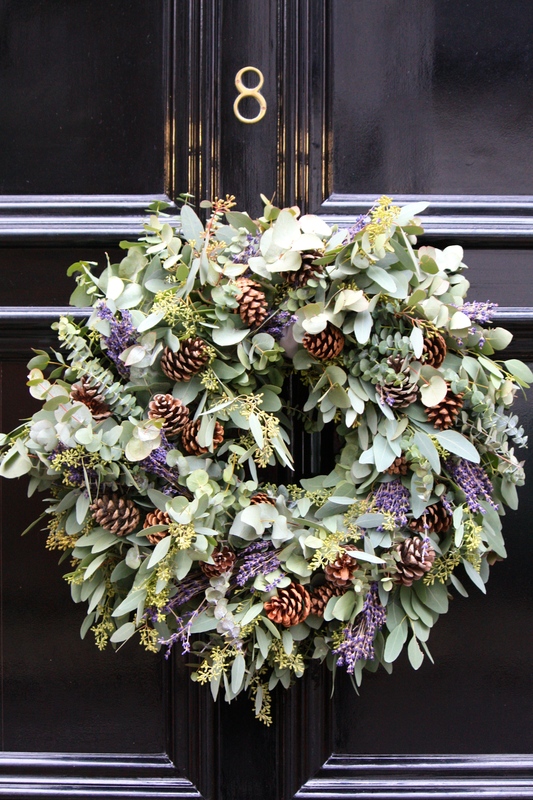 Liked the wreath with eucalyptus -very classy. It is one of my favourite gardening books too: I bought it in the Uk when it was launched and reread it some years later. 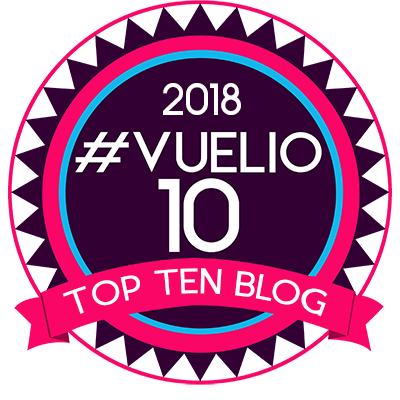 And as for ‘Endymion’ – I read the opening stanzas as you wrote this, but restricted myself to a vague (mis)quote in my latest post, as bringing it in would have taken me off on too much of a tangent… Have a memorable New Year! You too Jack. Looks like it’s going to be a wet and windy one!